Campbell became the first team to clinch a berth in the NIT after losing 69-64 at home to Gardner-Webb in the Big South Tournament. The Camels had been the top seed in the Big South and since they did not qualify for the NCAA Tournament, they will get an automatic bid to the NIT. Radford replaces Campbell in the bracket as the highest seed remaining. The Highlanders host Gardner-Webb for the conference title on Sunday. The Ohio Valley Conference title is on the line Saturday with Belmont taking on Murray State. It is possible that the loser of this game could be an at-large team. Belmont has a stronger case for an at-large bid that the Racers do, although I have added Murray State to the bubble. I have also added UNC Greensboro and St. Mary's to the bubble as well, although I am not very optimistic for either of them as at-large teams. I have added those teams in a desperate attempt to find teams that are really NCAA Tournament-worthy. It has been difficult this season. Every year, you hear people talking about how the bubble is "soft". Most of the time, that is not true, at least not compared to every other year. The bubble always looks soft because the teams on it are flawed in obvious ways. That is why they are on the bubble. This season is different though. It reminds me of 2016, when the committee had to take a handful of teams that would not normally meet its minimum standards just to fill the field. It was so bad that the committee took Tulsa that season, and even Tulsa did not think it could get picked. There's more on the standards of how the NCAA has evaluated bubble teams in the past after we look at the teams on the bubble in action Friday and Saturday. There is a "Double Bubble" game Saturday when Texas plays host to TCU (12 p.m. on ESPN2) and it is huge for both teams. Texas, as noted above, is just 16-14 on the season. They have shown the ability to beat some very good teams, but have tanked a couple of times at home and lost at Georgia, the second-to-last place team in the SEC. TCU has struggled down the stretch of this season, losing six of seven, including its two worst losses of the season. The Horned Frogs sweep of Iowa State is keeping them alive at the moment. They won the first meeting with the Longhorns at home. Minnesota -- Lost to Maryland 69-60: The Gophers win over Purdue on Tuesday has taken a lot of pressure off of this game. A win would put Minnesota in the field for good. Belmont -- Defeated Austin Peay 83-67 in the Ohio Valley Conference Tournament Semifinals: The Bruins easily handled Austin Peay and will try to play themselves off the bubble for good in the OVC title game on Saturday against Murray State. The Pirates' win over Marquette takes a lot of pressure off of this game, but a win over the Wildcats could punch their ticket. A win for the Tigers would be their second best of the season, and that is largely the problem with Clemson's tournament resume. A home win over Virginia Tech is pretty lonely in Quadrant 1. A win is likely only Quadrant 2, but still a win over a tournament team. The Gators are in trouble as well in part because of a loss to Georgia. That has put a lot of pressure on them to get another win or two to ensure selection. They gave up a chance at home to LSU Wednesday night. A loss today would mean Florida has to win twice in the SEC Tournament to finish four games above .500. More on why that's important below. The Wolfpack's problems are detailed below. Beating Boston College does not fix them, but losing another game to a league bottom feeder would add to them. The Hoyas are on life support after getting drilled at DePaul last time out. They could be catching Marquette at a good time because the Golden Eagles are slumping, having lost three in a row. Or this could be a bad time, as Marquette looks to take it out on somebody. Arizona State leads the potential field in bad losses and that shows up in their NET ranking of 71, which is the second worst of any bubble team. They are not in a position to take another loss to a non-tournament contender. A week ago, this was a "Double Bubble" game, but now it is only the Owls in trouble. Temple has won five of its last six after an ugly loss at Tulsa. The Owls could really use another win over a sure tournament team and this will be their best chance. The Crimson Tide are still stinging from the one they let slip away against Auburn, and now at 17-13, this is as close to a must win as Alabama can get. A loss means needing two conference tournament wins just to finish four games above .500, a key threshold through the years for the selection committee. UNCG is 24-5 and only lost by six points at LSU this season. However, the Spartans only Quadrant 1 win came at East Tennessee State, which they swept in SoCon play. Even though they have no losses outside Quadrant 1, getting blown out twice by league champ Wofford by a total of 59 points is not a good look. The winner is in as the Ohio Valley champ and the loser has a nervous selection Sunday. Belmont is clearly the better at-large candidate, but no sure thing with a loss. Murray State's profile only compares to one other team to get an at-large bid. That was Middle Tennessee in 2013, which only played four games in Quadrants 1 and 2, but did beat No. 48 Mississippi that season. The Racers best win is No. 135 Austin Peay. Creighton has been hot, having won four straight, including one at Marquette. At 16-13, the Bluejays need to stay hot against the Blue Demons, which have won two in a row themselves. The Paladins open Southern Conference Tournament play against Mercer, a team they cannot afford to lose to. Furman may be able to take a loss to one of the league's other top four teams, but not vs. the Bears. Our major conference champion and bubble sitter has not played well lately. The Huskies lost at Cal and escaped at Stanford and home to Oregon State. The Ducks will provide a challenge as well and Washington will have to play better than it has recently to win. Here is a look at some of the historic minimum standards and how this season's bubble teams are falling short of meeting them. I say historic minimums because they are not hard and fast rules. They are based on a 25-year history. Four games above .500: This is the best indicator there is for a minimum standard for selection by the committee. Only one team in 25 years has received an at-large bid that was fewer than four games above .500. That team was Georgia in 2001, which was 16-14 and played a schedule unlike anything we have ever seen. The Bulldogs played 27 of its 30 games against teams in the RPI top 100. If they had used the term "quadrant" back then, that would be quadrants 1 and 2. Nobody gets compared to that team because of its significant outlier of a schedule. This year, the committee may have to settle anyway. So far, I am reluctant to put such a team in the bracket, but Texas and Indiana are on the bubble at 16-14 and Creighton is 16-13. Alabama (17-13), Florida (17-13) and Seton Hall (17-12) are teams currently in the bracket that may also threaten this standard. 15 Losses: This is a relatively new low standard for the committee. Vanderbilt became the first 15-loss team in the field in 2017, and Alabama repeated the feat last season. Both had very strong strength of schedule rankings. The Commodores were No. 1 and Alabama's ranked third in their respective seasons. Both teams were 19-15 overall and 9-seeds in the bracket. I do not expect a 16-loss at-large team this season, and no team on the bubble or in the bracket has 15 losses already. Texas and Indiana already have 14 losses with one game to play before the conference tournament. Alabama, Creighton and Florida each have 13 losses. Only Texas has a strength of schedule ranking comparable to 2017 Vandy and 2018 Bama. The Longhorns are 4th. The next best is Creighton at No. 16. Non-conference Strength of Schedule: Speaking of strength of schedule, the committee has been very consistent about leaving out teams near the cutline of the bracket primarily because of a poor non-conference strength of schedule. Even in 2016, with as soft of a bubble as that was, 23-8 South Carolina was left out because of a NC SOS that ranked 271. Of course, the Gamecocks' RPI of 65 reflected that somewhat. This year, I give you NC State, which has a NC SOS ranking of 352. That is not a misprint. The Wolfpack has played the second worst non-conference schedule in all of Division I. And that is reflected in the RPI, which has NC State at 116. However, the RPI is no longer the standard. The NET is, and in part because the Wolfpack ran up the score on all those cupcakes, they rank 35th in that system. Do not expect the committee to be fooled. There is still time for NC State to play its way up the bracket to the point that the committee can accept that non-conference schedule, but that time is running out. Quadrant 1 wins: This is more of a fake standard. Some people believe if you have a handful or so of these, nothing else matters. That is not true. Yes, quality wins are important, but they are not everything and not all quadrant 1 wins are the same. Teams have received at-large bids with no quadrant 1 wins. It has happened four times since the expansion to 68 teams in 2011, most recently Georgia in 2015. Only Murray State is on my bubble without a quadrant 1 win and if they get one, they go off the bubble as conference champion. Most of those teams with zero quadrant 1 wins have at least eight quadrant 2 wins. The only team since 2006 to get at at large bid with no quadrant 1 wins and fewer that eight in quadrant 2 was Iona in 2012. Murray State has only one quadrant 2 win. On the other end of the scale, several teams have been left out with six or more quadrant 1 wins, usually for obvious reason. The record is eight, held by Michigan State in 1996. The Spartans problem is that they were only 14-15 overall. The most recent fan base that thought quadrant 1 wins were all they needed, only to be left disappointed, was Syracuse in 2017. The Orange had six quadrant 1 wins that season and were 18-14 overall. Their problem was an inability to win away from home. Indiana has six quadrant 1 wins currently and Texas has five, but each team is only 16-14 overall. Record vs top 3 quadrants: Again, this mostly applies to Indiana. The Hoosiers are currently just 10-14 vs the top 3 quadrants. This is basically the group of teams you have to show up to play against. Only one team has received an at-large bid with a record of more than one game below .500 against that group of teams. That was Temple in the soft bubble year of 2016, which was 8-10. Georgetown, Texas and Florida are currently one game below .500 against this group. Bad losses: Bad losses are typically defined as those to teams in quadrants 3 and 4. There have been only five teams to get at-large bids with more than four bad losses, most recently Wisconsin in 2016, which had six and was a No. 7 seed. That is the season Bo Ryan retired part way through and the Badgers turned their season entirely around, going on a roll through a tough Big Ten. No team is threatening that record yet, but Arizona State already has four and Belmont and St. John's have three each. Wins over other teams in the bracket: The committee specifically looks at this as well. 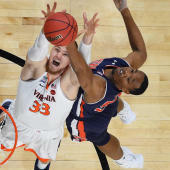 That is, they see how teams have fared against other teams either in the bracket or under consideration for selection. Only one team has ever received an at-large bid that was winless against the entire rest of the bracket. That was Oklahoma in 1998. Currently, Pac-12 leader Washington is winless against the field, and if Arizona State wins the conference tournament, that may be true on selection Sunday. Conference record: This is a fake standard. How a team performs in conference is irrelevant by itself. Obviously, it is relevant in the sense that conference games are 60% or so of a team's schedule and all of those games are on the team sheets, but the conference record itself and placement in the standings are not. The entire season is evaluated, with no specific weight on the performance in any one section of it. The only thing the committee cares about regarding conference performance specifically is which team is the automatic qualifier. So, for those of you saying teams with poor conference records cannot get at-large bids, you are wrong. We may have an inordinate amount of those this season and might even break the record for worst conference record in the field (Florida State, 1998, 6-10), but conference records are trivia, not criteria. If you have a philosophic problem with that, I feel you, but I can't help you.